Electronic health records are becoming an industry standard, and are being way of storing healthcare data. 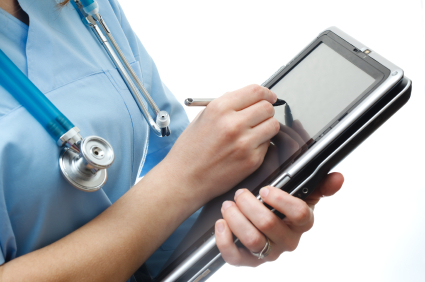 The overall utility of electronic health records can be greatly increased through the use of mobile technology. There are many benefits to providing mobile access to electronic health records, such as an increase in overall productivity, but the transition needs to be handled the right way. Security issues are of paramount concern when transitioning to mobile electronic health records, but when handled properly a mobile network will be no less secure than any other solution. The benefits of the mobile platform. With a mobile platform, electronic health records can be accessed using tools such as iPads and tablets, leading to an overall increase in healthcare technology. Electronic health records can be immediately updated everywhere, providing more accurate treatments. Further, health services themselves can be brought mobile: areas that are traditionally underserved due to a lack of technology will become more accessible. With mobile electronic health records quickly becoming an industry standard, any healthcare facility that wants to remain current is required to make the transition. Having mobile health records is a major selling point that can increase a practice's referrals. Electronic health records are the future. Electronic health records are being promoted by the government because they facilitate easier and more accurate healthcare. With electronic health records, patients will experience a higher standard of care because better and more timely information will be available regarding their health. Further, multiple institutions will be able to better coordinate a patent's care with a comprehensive EHR system. Electronic health records can also be used with a larger data set, to show medication interactions that could be dangerous, ensure that the medications are being dosed in a safe manner and reduce riskier procedures overall. The benefits of electronic health record technology will only increase as the technology is used and new applications and procedures are developed. Transitioning to mobile electronic health records. The major concerns when transitioning to a mobile health system are employee training and system security. Luckily, mobile EHR platforms tend to be fairly simple to use, as they are intentionally designed for ease of use. Employees do need to be trained on the appropriate ways to use the platform, and security protocols are absolutely essential. Granular security controls that manage access based on levels of clearance are the best way to ensure that mobile electronic health records remain stable and safe. Mobile device management may also be a necessity for the same reason. Employees will need to be trained on the security protocols in place as well, as without proper employee training a system might be considered vulnerable. Once the transition has been made, the healthcare provider needs to examine the electronic system to find ways in which it can be used to increase the overall standard of medical care. Electronic health records, and mobile electronic health records, are going to play an increasingly large role in the healthcare IT landscape for many years to come. EHR is the new standard for health records for a variety of reasons, and mobility simply adds to the utility of an already robust system. With mobile health records, care providers can instantly tap into their patient's information and use a wealth of diagnostic information to help in the medical care. Medical errors will dramatically go down as every movement can be verified against the patient's existing data. The transition to electronic health records and mobile health systems is inevitable; it is only a matter of when a healthcare provider decides to implement their new solution. If you're interested in getting started with electronic health records or moving your existing electronic health record system to a mobile platform, contact us today. RevenueXL provides a comprehensive, award-winning EMR & EHR software solution.